When thinking about planning an event, what typically comes to mind is, “Events take a lot of time and effort” – and that’s right. Whether it’s booking a venue, purchasing and setting up decorations, and of course planning and preparing what you will serve your guests, events require a lot of thought and take a lot of effort. To make things a bit easier, you can leave the planning and preparing of the food up to a caterer. And we’re here to fill you in (and up) on a catering secret to keep expenses down: serve pasta! 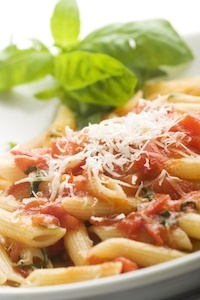 Pasta is perfect for large events, and it is the least expensive bulk food for caterers. Pasta looks elegant, tastes delicious, and lucky for you, you aren’t paying an outrageous amount of money to serve your guests a quality meal. Aside from pasta being affordable, you can also incorporate pasta in a variety of dishes. This staple can fit any event theme or cuisine from Chinese to I talian to Mexican. Whatever you crave, pasta can satisfy. Another major reason to serve pasta at your next event is because it is filling and nutritious (specifically whole wheat pasta). Whole wheat pasta is filled with fiber and provides plenty of protein, which in turn fills you and your guests up. There’s nothing worse than attending an event and having a growling stomach an hour after the meal is served. With pasta, you know you and your guests will stave off hunger long after you finish your last bite. At Nelson Bros. Restaurant and Nelson Bros. Cutting Edge Catering, Chef Dan is famous for his pasta bar. It’s a Wednesday night tradition at Nelson Bros. Restaurant, and he has taken this tradition to the catering side of the Nelson Bro. Company. Chef Dan’s pasta bar allows guests to choose from a wide variety of meat, seafood, vegetables, and seasonings, along with a choice of pasta and three homemade sauces. You also have the side options of bread sticks and salad. It is a delicious, and popular, restaurant and catering option, and guests love the free reign it gives them to create a custom plate of pasta they know they will enjoy. Just like the famous “Chef Dan’s Pasta Bar”, Nelson Bros. Cutting Edge Catering’s mini pasta bar features fewer ingredient options and a slightly smaller portion size. Guests can still enjoy chicken or shrimp and an assortment of vegetables (mushrooms, broccoli, onions and tomatoes). This option also gives you the choice to offer a side of bread sticks and/or salad. If your event is on the smaller side, this may be the perfect option for you. As you can see, pasta is the perfect option for any event you may have. With any event, a lot of planning is expected, but leaving the food planning and preparation in the hands of a caterer can relieve some stress. And if you want a dish that is not expensive, is filling, and can fit any occasion, pasta is it!